Is Homework Worth Paying for? Should I Pay For Homework Help? With no exaggeration, each of us has ever thought of the homework being done by somebody else. Moreover, some of us even dream of having a personal slave to do the homework only. Eventually, we get down to it by ourselves and burn the midnight oil. But what if it is really too complicated and includes the tasks which you have never seen before? 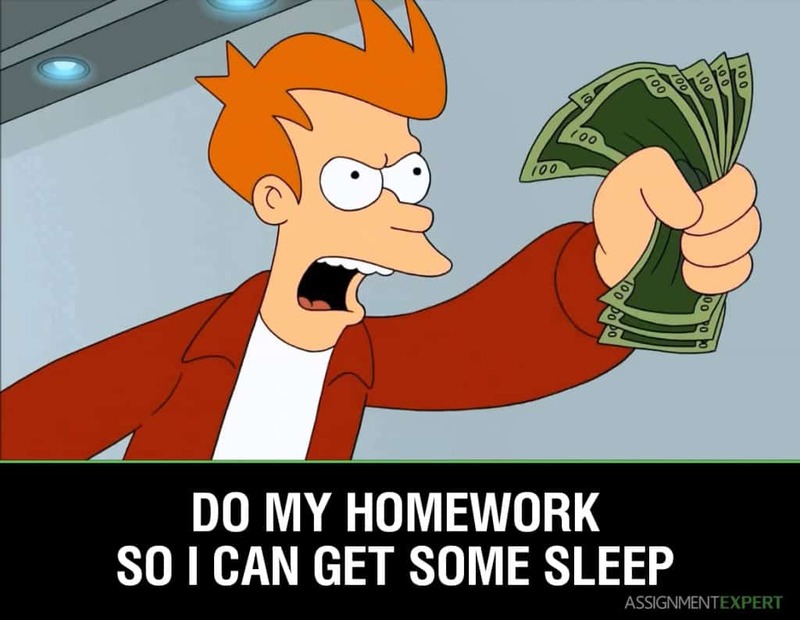 You think of homework help and you know that it will have its price. So, is it worthy of your money? Everybody has homework. However, being a practical kind of stuff, all your homework can be split up into two parts: active and passive. The former is interesting and communicative (such as group projects, presentations, reading some intriguing pieces) that brings you immediate benefit; the latter is a kind of what’s-wrong-with-my-teacher-i’m-not-gonna-do-this which contains all kinds of writing assignments that not only make your brain boil, but also take a lot of time to accomplish. And when you chose to prepare first, leaving the difficult part for the better times, you sooner or later understand that there’s nobody to do it for you and get down to do it by yourself ending up searching for help. And here we answer this initial question: not only rich guys who are busy with diving into their pools of money order their homework, but also ordinary youth with ordinary problems such as lack of time/sleep/understanding/desire. Additionally (don’t be surprised as it is quite a frequent practice), our service may boast that even parents of such teenagers turn to us for help when they see their children suffering over the pile of textbooks. They trust us because we don’t offer cheating, we assist with real educational help. Homework for Free or Paid But Excellent? So, let’s imagine it’s really happening and you face the problem whether or not to order a homework from different services. Immediately, it raises a question of how it should be paid (or should it, actually?). 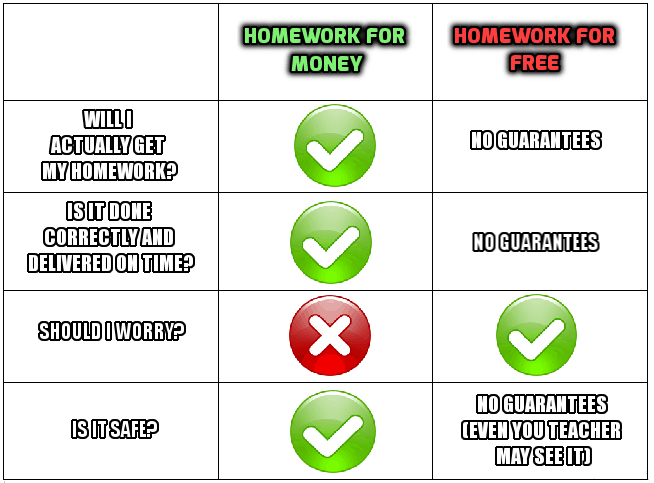 Let’s consider the option which first comes to your mind – homework for free. How did you actually do this? Hey, dude, where are you? Remember, homework for free doesn’t make you free from homework. Pay for Homework. What for? Now, let’s watch how it works when you pay for your homework. But firstly, here’s a question: would you do your personal homework if somebody paid you for each page? You say yes and the people who do homework for money also say yes, for a reward is the best motivation. Unfortunately, nobody’s gonna pay you, so your task is to find a trustworthy service. This is a key requirement to get a good grade. Company which agrees to execute your assignments for money should ensure you of a proper work being done on time. What is more, you should demand proofs of their success, details of information security and even money-back guarantee in case of failure. All these will prevent you from problems and even bring benefits. So you will not only get A, but also learn all the intricate material. That’s a curious question and we’ve analyzed the pricing strategy of lots of services before giving the answer. Normally, there’s a tendency to evaluate each separate page of paper by $10-50 per a page of printed text depending on the company. Thus, the smallest essay may approximately cost you from $30 to 150$. But still, you are not sure, what you are paying for. You need to sign in and submit your assignment with all the details, including the number of words/pages, deadline, and extra files if any. Why is this beneficial? Because the price of each task depends not only on its amount, but on the level of difficulty and the deadline. We also make you sure of what we do by constant online chat and great customer support. Moreover, you can easily “track” your homework and request to see the progress of your work by the moment and check whether the expert is doing everything well. Here you don’t have to overpay, just spend your time as you wish while waiting for your perfectly done homework. Here you may check out the feedbacks of our grateful customers. As you see, paid one or for free, the homework has to be done in any case. It’s up to you which option to choose, but weight all the pros and cons of both and you’ll feel the difference. Good luck!